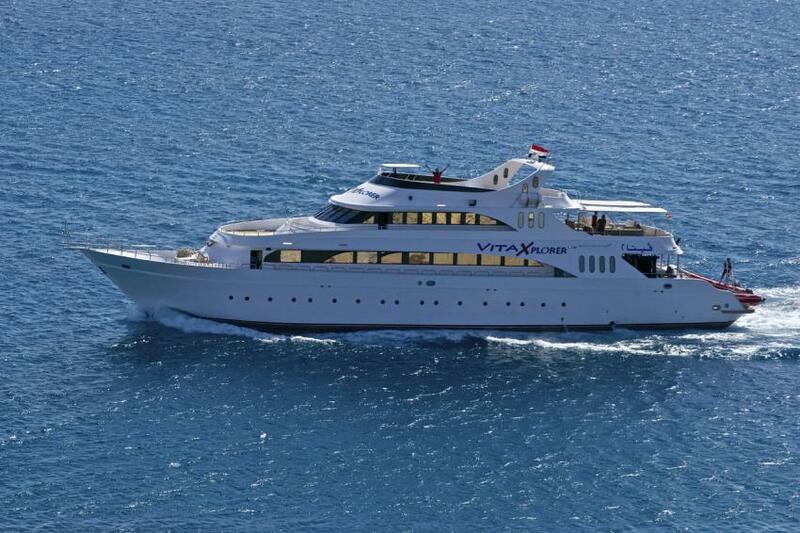 Vita Xplorer is one of the two Xplorer Fleets boats, that offers diving on the most attractive dive sites of Egypt. Boat was totally renovated in 2015, and now she is ready to welcome passengers on board. Vita Xplorer can has 11 cabins with double and king size beds. All staterooms are air-conditioned, supplied with private facilities and mini bars. Vita Xplorer has ideal facilities for the rest. Salon area is large, has air conditioning and cozy sits. The dining area has enough space for all boats guest to be comfortable. Boats sun decks equipped with sun loungers. Passengers of Vita Xplorer can stay at the shaded part to enjoy a gorgeous view of Red Sea, other can rest at the sun and get some tan. Vita Xplorers dive deck has all that necessary to prepare for the dive and to maintain your gear after, like rinsing tanks and storage boxes. For divers with certain certification, a boat can offer Nitrox fillings. Safety on a boat of Vita Xplorer is ensured by having an oxygen tank, first-aid kits, life jackets and 2 lifeboats. For those divers who is in fond of diving on wrecks, Vita Xplorer Liveaboard offers diving on such famous sunken ships as Thistlegorm, Rosalie Moeller, and Abu Nuhas ship cemetery. SS Thistlegorm now is one of the most well-known wrecks of Red Sea. On its deck divers still, can see trucks and motorcycles. Rosalie Moeller lies at the depth of 106 meters, o not every diver can see this ship, but some parts of it are visible. There are 5 cargo shipwrecks than now lies on the bottom that called Abu Nuhas. Divers have an opportunity to discover this wreck together with underwater creatures that now lives here. Vita Xplorer itineraries include diving on North and Ras Mohammed National Park, also Brother Islands, Daedalus, and Elphinstone. Ras Mohamed is a spectacular diving on reefs and walls, chance to see much pelagic fish. Barracudas, eagle rays and thousands of jackfish are often can be seen here. Diving on Brothers Islands represented by reefs and pinnacles, fascinating underwater scenarios. Sometimes silver tip sharks can be seen here and lots of barracudas. Hammerheads is also a common guest for this dive spot. Diving is Egypt is possible through the year. In winter water temperature can be lower, but this period is better for those who don't like crowds.